With Halloween just weeks away, looking for a costume that will drop their jaws? Astound 'em upside down with your creativity? While repurposing your broken umbrellas? Here's how to transform your basic black, handheld umbrella into an unbelievable do-it-yourself bat costume—an original costume I created for the Today show! Supplies: A black umbrella, wire cutters, scissors, hot glue gun, safety pins, fashion tape, black construction paper, stapler, black hoodie. 1. 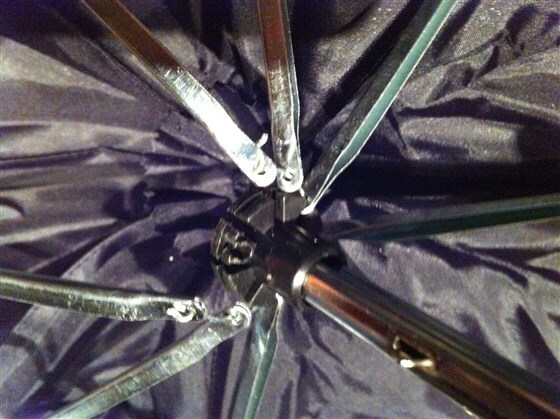 Unscrew the top cap from the top of the umbrella. 2. 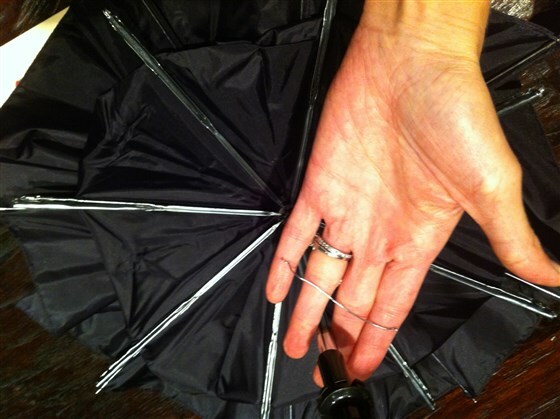 Using a wrench or small wire cutters find the two “twisty tie” wires that attach the handle to the umbrella. 3. Delicately untwist each, and unthread the wire from the spines of the umbrella. 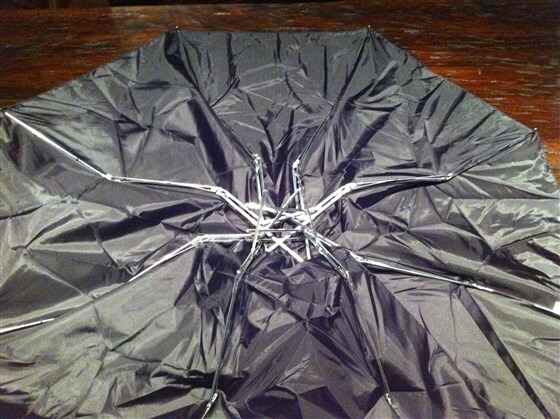 This releases the handle from the umbrella skirt. In my hand in the picture below, you can see that I’ve removed the twisty tie wire. You do this twice. 4. This is what the umbrella spines look like when they are being unthreaded from the twisty tie wire. 6. Use wire cutters to remove various parts of each spine (that’s what I call each metal wire, with numerous wires coming off of it) until you’ve pared it down to the main spine. These will be the “veins” of your bat wings. 7. Secure each spine down with a dollop of hot glue on to the umbrella skirt to keep the now-loose spines from poking you in the back and to maintain the “shape” of your bat wing. 8. 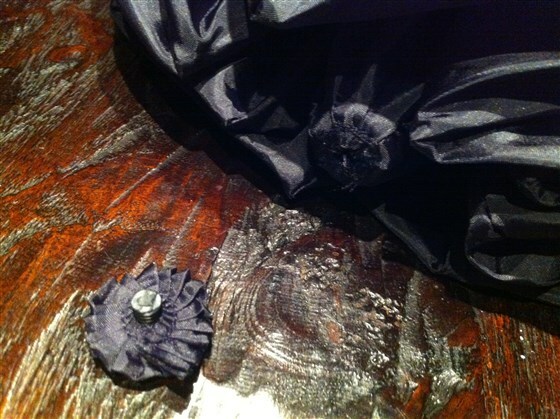 Lay your black hoodie down in the middle of your umbrella skirt. 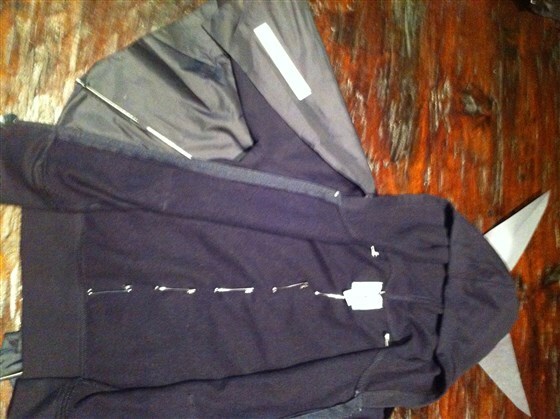 Use safety pins to secure wings to hoodie, up the inside of the back and inside sleeves. Use double-sided fashion tape to secure any loose flaps. 9. Cut pointy ears out of black construction paper. Staple on toward back of hood with a regular stapler. If you’d like further support to hold up ears, use black electric tape and secure edge of ear to hoodie. Hot tip: If you’re making this for a child, you may find that the span of the wings is too wide. I cut off 1-2 spines and accompanying umbrella skirt to make the overall wing span smaller.